A thought provoking, visually stunning, science fiction movie that’s rated G? Colour me surprised. And it’s actually good? Even better. This year in our College preaching class, we had to give a ten minute sermon on John 5:31-47 in front of a group of our peers. Here’s my sermon. I don’t preach from full notes, so it won’t match word for word what I said, but will be close enough. And at the bottom, I’ve included a picture of the notes I preached from. With smaller talks, I like to bluetack my notes into my Bible next to the passage I’m preaching from and preach with the Bible open in my hands. What did Jesus think about Christmas? What did he think was the reason he was on this earth? That was what my sermon was about on Sunday. The clip is from Mission Impossible II. Tom Cruise as just climbed up a mountain. A helicopter comes out of nowhere and shoots a rocket into the ground next to Cruise. Tommy boy opens up the rocket to find a pair of sunglasses. When he puts them on, he receives his mission. Then after he has received his mission, he throws them away and they explode. I’ve finally taken a step towards becoming a big boy blogger. I now own the domain name www.joelamoroney.com. The old address for Pop Culture Christ will still work, but you might want to update your bookmarks. What did Jesus think the point of Christmas was? Was it a birthday celebration or something more? That’s what I’ll be tackling in my sermon tomorrow. The Onion is a website I keep an eye on every week. It has two form: a satirical newspaper full of parody articles, and the AV section which is choc full of interviews and articles on pop culture. Going through the archives, there are quite a few articles that deal with Christianity and Christian culture. Always from an outsider’s point of view and always satirical. A recent article on the satirical front page caught my eye: “I’m Not One Of Those ‘Love Thy Neighbor’ Christians”. I found it particularly cutting and worth having a look at. You always know what you’re going to get when you walk into a James Bond movie. Hot girls, clever puns and fantastic gadgets. No surprises, just a good, action packed movie. Well that’s how it used to work. The last Bond movie, Casino Royale shook things up a bit. 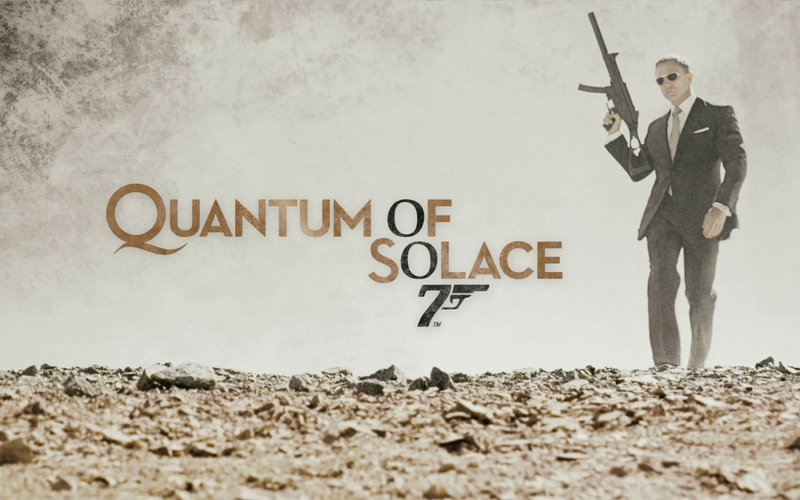 The latest Bond movie, Quantum of Solace, continues this trend. Daniel Craig returns in the lead role in a movie about revenge, greed and espionage.